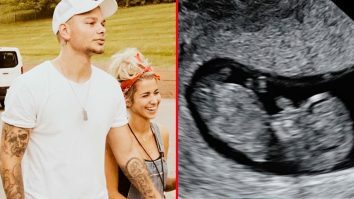 Just months after Kane Brown and his wife, Katelyn Jae, tied the knot at Mint Springs Farm in Tennessee, the two are taking another big step in their relationship…they’re becoming parents! Now, just six months later, the newlyweds are going to be new parents! Kane was the first to share the happy news about Baby Brown, taking to Instagram to share an ultrasound photo of the baby. “It’s been so hard keeping this a secret!!!! !” he wrote. Now that Kane can tell the world that Katelyn is expecting, he wants everyone to know how excited he is to become a father. “IM GONNA BE A DADDY!!!!!!!!!!!!!!!!!!!!!! !” he exclaimed in his announcement post about the baby’s impending arrival. Katelyn followed up with a post of her own a couple hours later. Instead of sharing a photo, she opted to share a short video from what we assume to be her first ultrasound appointment. With her husband by her side, Katelyn watched in amazement as their baby’s ultrasound appeared on the screen next to her. She instantly burst into tears, but was also laughing over the shock of the whole experience. In the caption to her video, Katelyn wrote that she was laughing and crying so hard that the technician actually had trouble getting pictures from her ultrasound. But we’re sure the technician was more than understanding, as Katelyn is clearly overjoyed to be having a baby. “@kanebrown_music I love you so much & am so excited to have an addition to our family to share our everyday fun, travel , & love with,” she wrote. The couple recently made an appearance at the ACM Awards…and no one had any clue that Katelyn was expecting! Kane and Katelyn found themselves on many best-dressed lists that emerged from the night, as people loved Kane’s classic black suit and Katelyn’s form-fitting black gown and elaborate necklace. Kane was one of the performers at the ACM Awards, and joined R&B artist Khalid to sing a mashup, with included “Good as You.” Katelyn was watching from the audience, which made the performance so sweet to witness. You can relive that ACM Awards performance below. Isn’t it crazy to think that Kane knew then that he was going to be a father, but no one else did?